Mammoth Lakes, Calif. (March 26, 2014) — As fishing opener nears, the latest angling news in the Eastern Sierra is that the Town of Mammoth Lakes and Mammoth Lakes Tourism are working with Desert Springs Trout Farm for fish stocking in the Mammoth Lakes Basin for 2014. “Conway Ranch’s water issues are very unfortunate, but luckily we have found a solution for this year with Desert Springs,” explained Mammoth Lakes Tourism Executive Director, John Urdi. Desert Springs will provide at least 11,000 pounds of fish compared to the 7,600 pounds (nearly a 45 percent increase year over year) the Lakes Basin received last year, which means anglers will have an even greater opportunity to land a big one this summer. “The fish that will be stocked in the Lakes Basin would be the same types of trout that Eastern Sierra anglers have caught in the past, from browns to rainbows, etc.,” said David Mcfarland, partner of Desert Springs Trout Farm. The trout will also be the trophy-sized, 3-5 pounders to which Eastern Sierra anglers are accustomed. “Not only will we continue to have frequent fish stocking, but in the Mammoth Lakes Basin we will have even more fish,” Urdi continued. The extra fish are coming from a combination of Town of Mammoth Lakes and Mammoth Lakes Tourism funding. The extra fish mean the lakes will continue to be stocked well into October ensuring great fishing opportunities through the end of the season on Nov. 15. Anglers visiting in the fall at the end of the season will have just as good of a shot to catch a huge fish as someone visiting earlier. As always, anglers 16 years of age and older must have a fishing license. You can purchase an annual, one-day or two-day fishing license (valid for two consecutive calendar days). Information concerning license requirements, places to purchase and fees maybe obtained from the Department of Fish & Wildlife or by calling 760-934-2664. 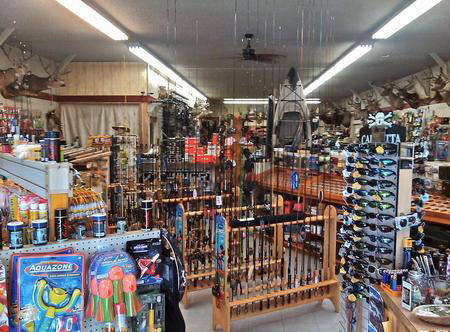 Fishing licenses may be purchased in several locations around the town of Mammoth Lakes.